Do not expect again a phoenix hour, The triple-towered sky, the dove complaining, Sudden the rain of gold and heart’s first ease Traced under trees by the eldritch light of sundown. You that love England, who have an ear for her music, The slow movement of clouds in benediction, Clear arias of light thrilling over her uplands, Over the chords of summer sustained peacefully. Tempt me no more; for I Have known the lightning’s hour, The poet’s inward pride, The certainty of power. Cecil Day-Lewis was born in Ballintubbert, Queen's County, Ireland. He was a Irish editor, poet, novelist and professor. 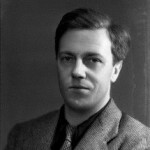 He also wrote mystery stories under the pseudonym of Nicholas Blake. He was educated at Sherborne School and at Wadham College, Oxford. His first collection of poems, Beechen Vigil, appeared in 1925. During the Second World War he worked as a publications editor in the Ministry of Information. After the war he joined the publisher Chatto & Windus as a director and senior editor. He later taught poetry at Oxford, where he was Professor of Poetry from 1951 to 1956. During 1962–1963, he was the Norton Professor at Harvard University. He was appointed Poet Laureate in 1968, in succession to John Masefield.